Imagine yourself living in China during the eighteenth century (around the time of the American revolution). Your big sister was married the previous year and is now expecting to have a child. Everyone is excited, but you are worried whether your sister and the baby will be okay. Mrs. Chen down the street was in labor for three days and when she finally gave birth, the baby was dead. Also, one of your father’s friends at the office lost his first wife in childbirth because she began to hemorrhage when they tried to get the baby out, but they could not stop the bleeding. What can you do to help ensure that your sister will give birth without any difficulties?During the eighteenth century, when people tried to manage a difficult childbirth, they turned to three main strategies: religious, manual, and pharmaceutical. First, people believed in many different kinds of gods, spirits, and superhuman beings who could both cause and cure diseases. These included gods and goddesses whose job was to promote fertility, protect women in childbirth, and ensure the health of newborn infants, and you could pray or make offerings to one of them. You could also hire a priest to make amulets or write paper charms to enlist the help of various gods and chase away evil spirits. Besides asking the gods for help, you might take precautions to ensure that the gods would not be offended by the blood and other bodily fluids when your sister gave birth. A common belief was that deities considered childbirth to be dirty and contaminating and might punish the woman by making childbirth difficult. To avoid offending the gods or spirits, you could perform rituals as a way of apologizing in advance, position the birthing room in a particular direction, and bury the child’s placenta in a particular place according to the alignment of cosmic forces that was in effect during the month of birth. You might also want to calculate whether your sister’s horoscope was in harmony or disharmony with the cosmic forces that would be dominant when she went into labor. If disharmony were predicted, then you would perform a ritual to neutralize the danger. You could also try to hire the best midwife in town. In eighteenth-century China, female midwives supervised childbirth. A skilled midwife would make sure that all the necessary preparations and precautions were taken, and she would also know how to handle emergencies, such as turning a baby into the correct position for birth. But, if a midwife did not have skillful hands, manual manipulation would be ineffective and sometimes even harmful. Finally, there was a long tradition of using different combinations of pharmaceuticals to assist and hasten birth. Traditional Chinese medicine defined the body as a holistic system of vital essences and energy flows. These essences were all different forms of qi, which made the universe and animated all life. People became ill when the flow of qi through the body was disturbed or became unbalanced. Likewise, many doctors of the eighteenth century believed that difficult labor arose because of bodily disharmony, which could be treated by drugs (and sometimes by acupuncture). Therefore, to help your sister, you could consult a local doctor, who would recommend medicines to prevent difficult labor or help resolve a difficult labor when the midwife’s efforts had been futile. Or you could read some medical books yourself. By the eighteenth century, there were probably thousands of medical books in circulation, including specialized texts on women’s diseases and childbirth, and they provided recipes for childbirth medicines and instructions for their use. 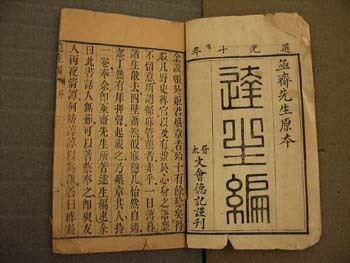 One of the most famous childbirth texts in China was the Treatise on Successful Childbirth. Want to know more? See: WHAT IS THIS THING?